A bit of history. I've used some terms that are traditionally Kiwi, I wonder if they will be understood. eg. Cockies = farmers. Hydatid. If not eradication, at the very least control of hydatid and sheep measles has been achieved by six monthly visits to the dosing strip with your dog or dogs. The strip was a chain long strip of grass on a country road-berm that had been mown short in preparation for the day. There was a sign at each end in red paint: ‘Hydatid Dosing Strip’, it read. The dogs hated it! They were chained to the spot, a plastic pottle allocated to each dog, with a lid onto which the owner wrote the name of the dog. Angus the dog doser, would administer a fairly potent laxative orally to the dogs, which was the reason for the chaining! When the dogs did their business, Angus would scoop it into the pottle and off to the lab it would go for testing. Bert and I walked our dogs for some one and a half hours to the strip, so they were empty by the time we arrived there. Ol’ Angus had that sorted too! He had a drench-gun that he shoved up the dogs’ bum and squirted some gunk up there! It was all one practiced motion; grab the tail with one hand and lift the whole rear end off the ground and before the dog could say, ‘How’s ya father?’ he’s shoved the gun in! Whatever it was he poked up there was powerful! No doubt about it! But Bert reckoned the treatment made Meg crook! It was a half day out for Bert and me, even though it would have been quicker to pop the dogs on the back of my truck! I could’ve been at the strip in less than ten minutes, but the hour and a half walk with Bert was a chance for me to milk knowledge from him. He was in his mid-fifties and had a lot of experience under his belt, while I was in my early twenties so had a thing or two yet to learn. Actually, I was his boss, but I would always learn more from him than he would from me! If I was to give him any kind of title, it would be philosopher. He was the forest’s grader driver, and had been its rabbiter. As anyone who works alone would know, you get to think a lot. Your mind works overtime and you have a choice, stew or philosophise. Bert philosophised. He was a returned man, having served in the Pacific and in J Force, the occupying force in Japan. He didn’t thank the fence-sitting Yanks for their late entry into the war, nor for what they did to Hiroshima and Nagasaki. It rang a bell because my Dad spoke those very works, he was of the same generation. Bert didn’t have much time for Generals or the military arm-wavers. And he wouldn’t wipe his arse with a politician! ‘Line ‘em up agin’ a wall, the bastards!’ Was his way of sorting them out! I suppose the old bugger had latent Anarchistic tendencies! But you knew where you stood with him! Meg was Bert’s timid little eye dog, timid with people maybe, but she could out-stare any rogue ewe! My dog Wally, was a Dobermann/German Short-haired Pointer cross and I could trust him anywhere, anytime. They might not have been friends, but they were tolerant. Bert had Meg well under control walking at his heel all day long. Wally’s default setting was to walk with his shoulder against my knee, waiting eagerly for a flick of my thumb, the sign for him to run free. 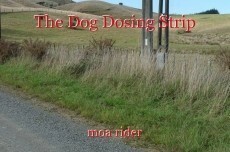 All the farmers at the dosing strip had sheepdogs, no pets save the odd truck-cab-sitting, yappy, foxy. The cockies eyed Wally with suspicion and offered snide remarks about his three-fifths of a tail. I would casually point out that their dogs chased sheep merely through instinct, on the other hand, Wally did what I told him to do because he was intelligent. The older cockies believed they were the backbone of the country, so carried a bit of arrogance to the strip, and thought they should have priority. They reckoned we forestry workers weren’t proper country folk, and anyway, because we were government employees, we didn’t do a decent day’s work. They would scoff at us finishing our day’s work at 4:30! Yep, we’d heard it all before! Been insulted by experts! Even at school committee meetings, the talk was wool or bloody lamb prices, which excluded me, but put me on equal footing with the head teacher, which everyone found had its advantages! Once, to prove a point, I issued one mouthy bloke a challenge. I would pay his wages for a week, if he could work with my pruning crew and last the week. If he lasted. I would pay him double from my own pocket as well. With an audience of a dozen or so other cockies at the strip, he couldn’t very well back down. He did put in a day with us, but that one day was enough for him! Anyway, the drop in wool and lamb prices and the upswing in log prices saw the gradual erosion of the backbone-of-the-country attitude. Our journey to and from the dosing strip was always a leisurely stroll through forest and farmland, which included a river crossing. We squelched along in or wet boots for a while, hardly noticing the discomfort. These day, hydatid is pretty much eradicated and the dosing strip has been consigned to memory and folklore. Today’s dogs don’t know how luck they are! Well, that was a pretty....unusual read, Moa. And yep, today's dogs are definitely the luckier ones!